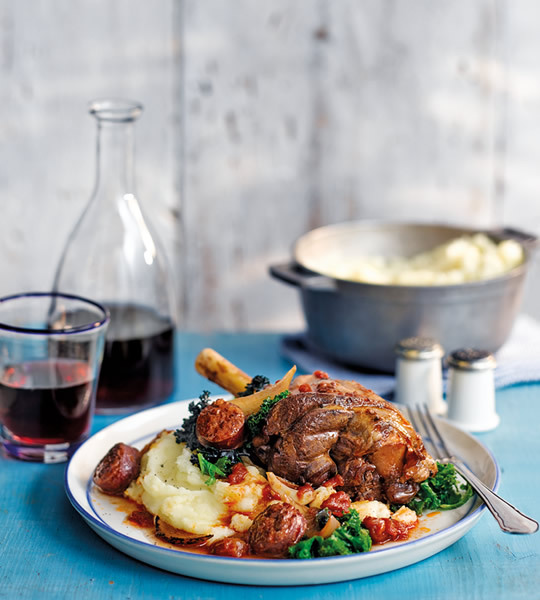 Slow-cooked until tender and falling off the bone, this braised lamb shank with chorizo and red wine is one our star recipes in this month’s ocadolife magazine. A great alternative to a leg of lamb, these juicy lamb shanks are served with comforting, buttery mash and are sure to wow at Easter Sunday lunch or dinner. Preheat oven to 220°C/200°C fan/Gas Mark 7. Place the lamb shanks, onion, chorizo and olive oil in a large casserole and stir well. Roast uncovered in the oven for 10 mins, then take out and add the crushed garlic, thyme and paprika. Stir well and roast for a further 5–8 mins until lightly browned. Remove the dish from the oven and pour in the red wine, stock and tomatoes. Stir in the bay leaves and cover with a lid. Lower the temperature to 150°C/130°C fan/Gas Mark 2 and cook for 2 hrs, until the meat is coming away from the bone. Half an hour before the lamb is done, place the potatoes in a large pan of cold water and bring to a boil. Simmer for 10–15 mins until tender. Drain the potatoes thoroughly. Add the butter and allow to melt before mashing smooth and seasoning to taste. Stir the kale into the casserole dish and leave to cook in the braising juices for 5 mins before serving with the lamb shanks and mash. This entry was posted in Talking Ocado and tagged Easter, lamb, lamb recipe, Recipes by Ocado. Bookmark the permalink.